In my humble opinion: This would be an awesome (granted unlikely) tie in between the two shows. Let me be clear though, this is just from my own mind, I haven’t read anywhere or heard anything about this actually happening, but how cool would it be if Rosie popped up as one of the undead? I really do think the people at AMC incorporate little nods or subtle references to other shows on their network. Case in point: I was watching Breaking Bad Season 4 the other day (awesome show), trying to get ready for the upcoming season. There is a scene where Walter is being ordered by his wife Skyler to return the car Walter had just bought for his son to the dealership. The car is a brand new, red Dodge Challenger and Skyler insists that when Walter returns the car he asks for the manager Glenn. “Glenn?” Walter asks…then pauses. This was obviously a nod to the character Glenn from the Walking Dead and the car he fell in love with in season 1 (you remember Glenn speeding out of the city in his new red Challenger right?) Anyway, whether Rosie Larson’s Zombie shows up on The Walking Dead or Don Draper finds a time portal and agrees to head up the marketing campaign for Walter White’s new miracle drug, AMC’s shows are worth a look. The Dark Knight Rises…Batman Will Not Die!!!!! 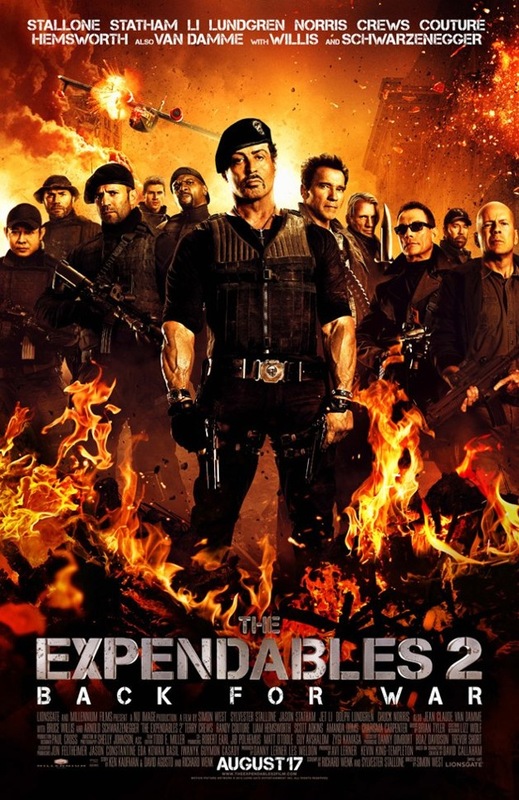 In my humble opinion: I remember watching The Expendables when it came out…it was alright. The main beef I had to pick with it was that it was being marketed as bringing all the 80’s muscle man heroes into one film. I will admit, there were a good number in the film but….only for about 2 minutes. I mean the scene with Stallone, Willis and Ah-nald in the church was cool, but come on…we wanted to see the boys in action not in cameo roles. At least with the second one we have them all getting their hands dirty. Stallone, Arnold, Willis, Lundgren, Van-Damme…and Norris even shows up (props to him for being in his 70’s) although I would have liked to see Carl Weathers, Jesse Ventura, Michael Dudikoff, and Mr. T in there somehow. And of course, with the guys that are in it, I just hope they aren’t too old and brittle to make the action look cartoonish. I mean in the preview Arnold says, “I’m back”….but are you really Arnold? Here’s to hoping that he (or any of them for that matter) aren’t in a Cialis commercial by the time the movie comes out. The original Legend was far from Legendary, but the cult film deserves a remake! In my humble opinion: Ridley Scott seems to be on a nostalgia kick as of late; the Alien prequel Prometheus and the rumors that he is planning either a prequel or sequel to Blade Runner. I would like to request that Mr. Scott also take a look at another one of his films (one of my favorite…but more on that in a minute). The movie Legend was not one of his more successful films by any means, but over the years has developed a cult following and warrants some updating. If you haven’t seen it, the plot follows a young forest dweller named Jack (played by a Peter Pan dressed Tom Cruise) who is madly in love with a beautiful girl named Lilly (played by Mia Sara). One day, in order to impress Lilly, Jack takes her to see the majestic Unicorns (which are the guardians of light). Unfortunately, Lilly can’t help but approach and touch one of the Unicorns…a big no no. This is all happening while the Lord of Darkness (masterfully played by Tim Curry) is plotting to kill the unicorns which would result in the land being cast into eternal darkness….adventure ensues. In my humble opinion: They need to bring back Nerds Cereal. I had an idea for a new cereal and after googling it, it was confirmed that it was attempted at least once before already. Nerds Cereal came out in the 80’s and featured a split box of two different flavored cereals…obviously it didn’t take or catch on as well as the candy has. But why not bring it back, a few little tweaks and you’d have yourself a helluva product. Basically…it would be Trix. Just model the Nerds Cereal box after the big candy boxes you can get from Wal-Mart or the Movie Theatre…..you know the big Rainbow box with all sorts of different flavors inside. Turn that into a cereal box and there you go….Nerds Cereal has made its comeback. Well Mr. Wonka….here’s to hoping.